A Unique Park and Gated Community in Lake Mary! 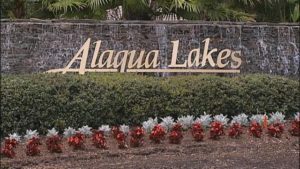 Alaqua Lakes is located near the intersection of W Lake Mary Blvd and Markham Woods Road in Lake Mary, FL. It is an upscale community that is secured 24 hours a day by a staffed Gatehouse. Seven Acre community park that includes an open-air Pavillion for community or residents private events. The multi-purpose offers the perfect place for residents to enjoy family sports like soccer or baseball. The park also includes a basketball and soft sand volleyball courts plus a fully equipped children’s playground. The resort style community pool offers complete changing facilities and is available for swimming and sunbathing including a separate wading pool for babies and toddlers. The area is surrounded by lush landscaping that provides a tropical environment for you to relax and enjoy the Florida sunshine. Five Lighted Tennis Courts allow for day and night play and staffed with a full-time Tennis Pro who is available for private lessons. Residents can participate in a variety of tennis activities including a youth program with summer tennis camps. Social activities for both youth and adults as well as a Ladies Association that hosts numerous charitable fundraising and social events. Alaqua Lakes is secured by a 24×7 staffed Gatehouse. For more details click to visit the Alaqua Lakes Community Association website.